Mobile GIS software can enable improved data collection and survey workflows and can ensure provision of accurate, up-to-date information to field workers. 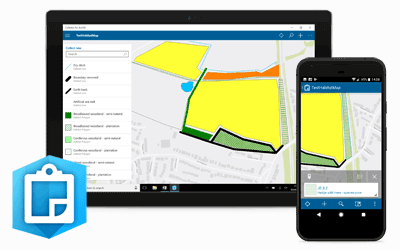 GIS4BUSINESS offers Mobile GIS solutions that operate in online and offline situations on Windows, IOS and Android devices. Some of these solutions can make use of high-accuracy GPS equipment, where a greater level of accuracy is required. Feel free to browse a selection of our mobile GIS software products below, but please contact us to discuss the options in more detail. GIS4BUSINESS has experience gained from a number of mobile GIS implementations and can advise on the best fit mobile GIS solution for your requirements. We can also assist with setting up your mobile GIS solution and integrating it with other systems and applications. Esri Collector for ArcGIS®is a configurable map-centric field data collection app for Windows, Android and IOS devices. Collector for ArcGIS can operate in online and offline modes and supports external high-accuracy GPS devices for improved accuracy.